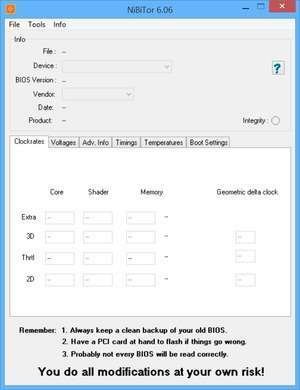 NVIDIA BIOS Editor (also known as NiBiTor) is a video tweaking application for NVIDIA GPUs. The application provides tools for overclocking graphics processors and is able to edit values in the display adapter's BIOS to enable these tweaks. NVIDIA BIOS Editor provides additional performance gains for gaming, both in 2D and 3D environments. Overclocking provides improvements to DirectX and OpenGL gaming. Version 6.0.6 is a freeware program which does not have restrictions and it's free so it doesn't cost anything. For security reasons, you should also check out the NVIDIA BIOS Editor download at LO4D.com which includes virus and malware tests. Additional screenshots of this application download may be available, too.